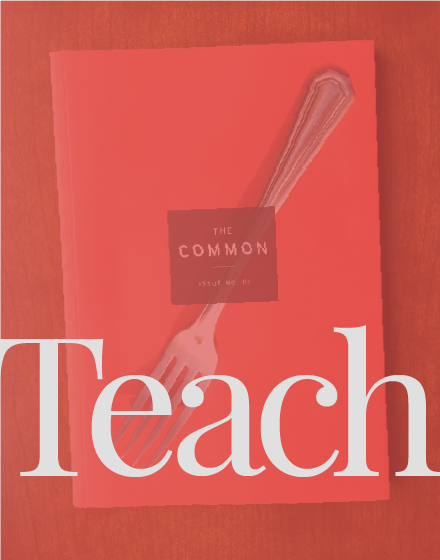 Learn more about teaching The Common and request a free sample issue. Imagine a literary magazine (or journal, or review—use whichever term you prefer) that YOU would like to read on a regular basis. Remember that a literary magazine values good writing and good thinking. Its purpose is not commercial or professional; its purpose is to showcase new, high-quality writing. Now pretend you’ll be the magazine’s founder and editor-in-chief. As such, you need to develop a “pitch”—that is, a brief, compelling description of the publication that you can offer to people who might be willing to help you make it happen. Naturally, you’ll say that the quality of the writing will have to be consistently excellent—otherwise, why bother? Beyond this essential requirement, think about what you would you like your new literary magazine to contain. Consider subject matter and themes or topics. Think, too, about genres: will you publish fiction, nonfiction, poetry, drama, graphic elements and visual art/photography, etc.—all of these, some of these…? What is your magazine’s mission? That is, what audience does it hope to reach, and why? What kinds of writing does it want to discover, support, and promote? What impacts do you want it to have, and why? Draft a one- to two-page proposal for your new literary magazine. Offer as many details as possible about the mission, contents, and categories of writing (and visual art, if any). Give examples of the kinds of writing and writers you’d like to feature in your magazine’s pages. Refer to at least one of the authors we’ve read this term as a means of indicating your taste. Be specific, clear, and realistic. Put yourself in the shoes of someone to whom you’re pitching your ideas. What would such a person need to know about your plans in order to “buy” your proposal? Make sure you have examples of authors you’d like to publish. Offer at least three. Include a paragraph of prose, a few lines of poetry or drama, or a sample of visual work to show what you have in mind when you consider the kinds of contributors you’re looking for. Sketch the cover of your litmag if you can visualize it readily in your mind. At a minimum, come up with a TITLE for your publication and, if it’s a print publication rather than online, decide on the TYPEFACE for both the title and the text in the magazine itself. State if you’re interested in publishing literature in translation or only in English. Describe your potential reader in as much detail as you can. Describe your editorial focus—themes, subjects, points of view—in concrete and clear terms. Avoid abstractions! Offer a sample table of contents to show what sorts of categories (literary genre, other types of art, graphics; video/interactive things, blogs, etc., if online). Will you review books or art in your pages? Will you have a space for readers’ letters or comments (print as well as online)? Will you, as editor, offer an editor’s note each month, occasionally, or only at the launch of the magazine? lf you’re planning on using social media to promote the magazine or as part of what the magazine offers the public on a regular basis, do some research to decide which social media platforms you’re pursuing and why. How will you raise money for your magazine? lf you’re setting up a nonprofit organization to publish the litmag, what funding organizations will you turn to for assistance-state/federal arts organizations, private foundations, etc.? Do some research into the possibilities. Look at the websites of the NEA and NYFA for ideas. Ask yourself, as you revise your proposal, how to make sure your litmag is different from others on the same topic or in the same realm. Draw your reader in, right away, with a sense of your passion about the magazine you’d like to launch. You’re the editor of a new literary magazine that publishes a wide variety of stories—all literary, none commercial. (This means the quality of the writing is very important to the magazine.) Pretend that none of the stories we’ve read this term have yet been published; their authors have sent the stories to you for consideration. Pick your three favorites and say why, in your view, these three stories rise to the top of the pile. Make a solid argument for their publication to your editorial team (i.e., your classmates), in order to convince them to publish these three. Write five pages, making sure you include specific references to the text(s) you examine. In this exercise you will explore the multidimensionality of a poem, essay, or story by “living with” the author and translator: reading and thinking about their work every day for a week. This is a multi-step assignment so read carefully and make sure you plan in advance. The following is a collection of resources for students and teachers exploring The Common’s works in translation; see also: resources focused on Arabic literature in English translation.